eClock is the innovative low cost digital punch clock, of high quality, for the attendance tracking and personnel accesses control, in office, headquarter, new store or warehouse. The only punch clock that starts in 1 minute with a simple Wifi or Ethernet connection, without any infrastructure or installation. eClock transmits the attendance tracking data in Real-time and allows to save more than 70% compared to a traditional punch clock. 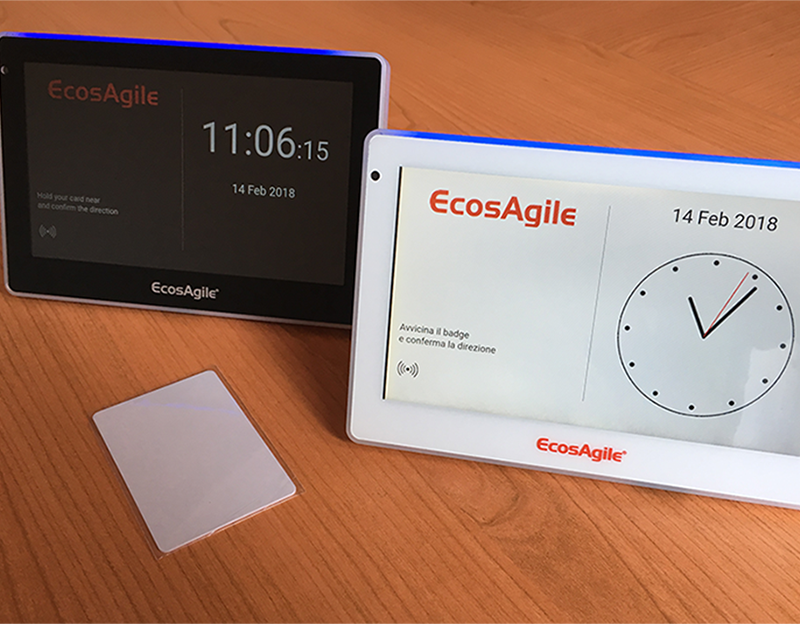 eClock is synchronised with the Ecosagile Time system and with the attendance tracking systems already in use in your company for the customized control and clocking anomalies management. eClock makes easy and modern the clocking management, thanks to the NFC, RFid technology with personal cards and badges. eClock doesn’t require any infrastructure or installation cost. The device has a really elegant appearance, It can be found in two different color versions, and it can be affixed in any location and on any surface: Wall, window pane or also lean on flat horizontal surfaces like tables, writing desks and receptions. The digital punch clock eClock is perfectly in compliance with all the Data Protection Authority, The data management is entirely in Italy in total respect of the national and european rules. Resets infrastructures costs for the physical punch clock installation: it doesn’t require any installation, cables, data collectors or control units. A simple Wifi or Ethernet connection is enough. Uses the NFC, RFid technology with personal cards and badges to be placed near the device for an efficient, prompt and secure attendance tracking. Real-time synchronisation: It gives the company the data for the processing without need for any collectors, data files transmission, night synchronization or transmissions at the end of the month. 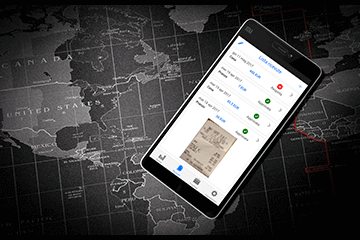 Applies many authenticity controls, allows the attendance anomalies analysis with some customizable control rules integrated to the Time Management. 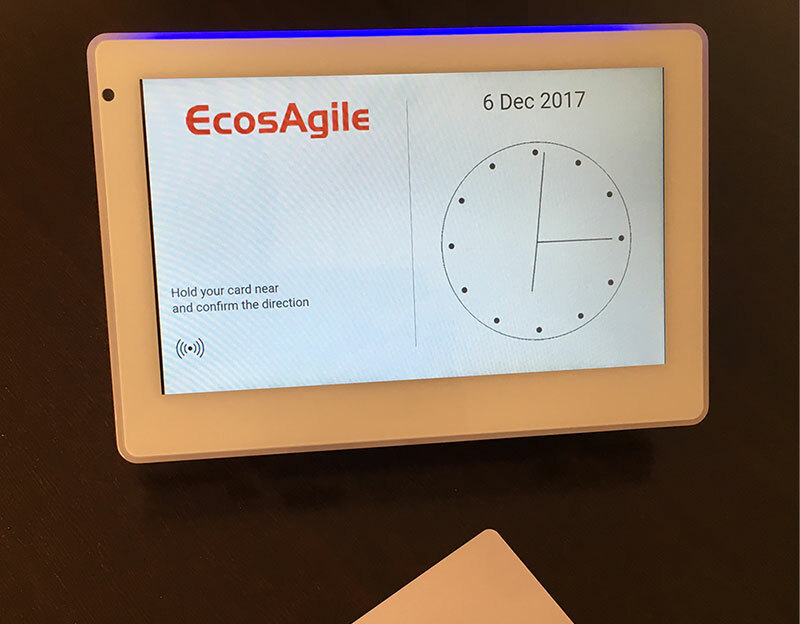 Change your way of working with eClock, the fashion and agile digital punch clock. eClock resets infrastructure costs for the physical punch clock installation. eClock allows to save more than 70% compared to a traditional punch clock because it doesn’t require any infrastructure or installation cost, any cables or masonry works, but a simple wifi or ethernet connection is enough. eClock is the first punch clock with an elegant appearance. It can be affixed on any surface, from the wall to the window pane or also lean on flat horizontal surfaces like tables, writing desks and receptions. 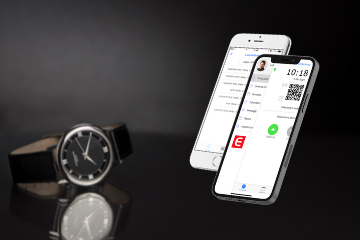 eClock transmits the personnel attendance tracking data in real-time, through a wifi connection. 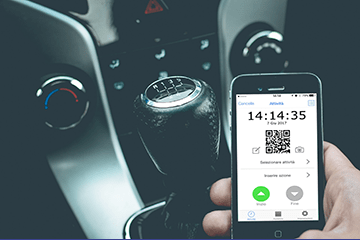 The worker places the badge near the device and data are automatically transmitted to the Attendance system without need for any night synchronization or transmissions at the end of the month. eClock prevents the clocking hours forgery thanks to some proprietary anti-fraud algorithms. 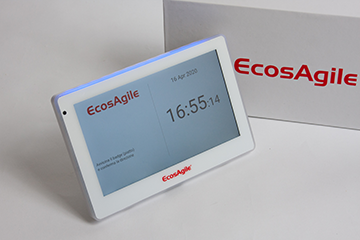 It gives also some hints for the clocking anomalies resolution through the integration with Ecosagile Time Management. eClock guarantees the access control for the company security. eClock gives in real-time the data concerning the presence in company useful for the company security and for the control of the responsibles (first aid, fire fighting, etc.) and to ensure the compliance of the rules; it also helps the entrance and guests management and the company reception. eClock uses a NFC, RFid technology with personal cards and badges. 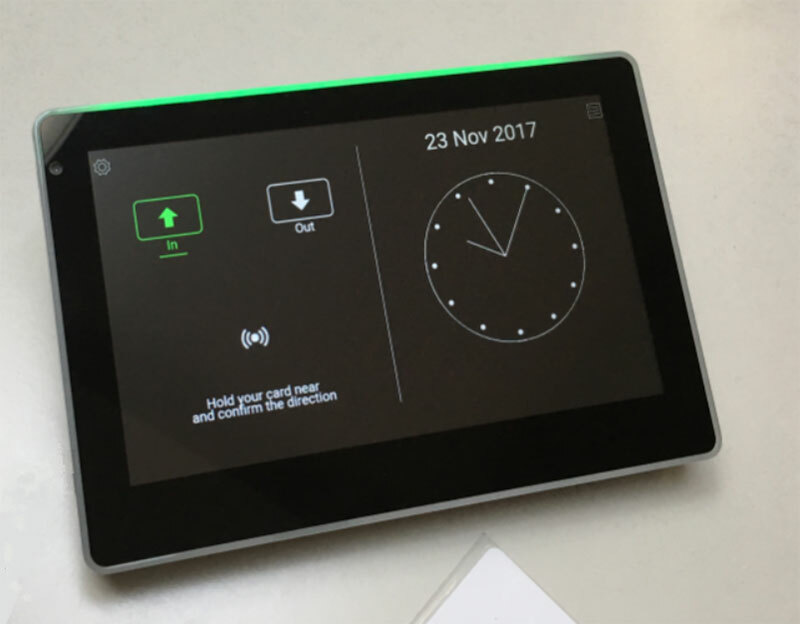 eClock eClock stands out for its simplicity, it takes just a simple gesture to communicate the attendance tracking with a simultaneous transmission to the competent offices and the responsibles. eClock can be customized as you wish. 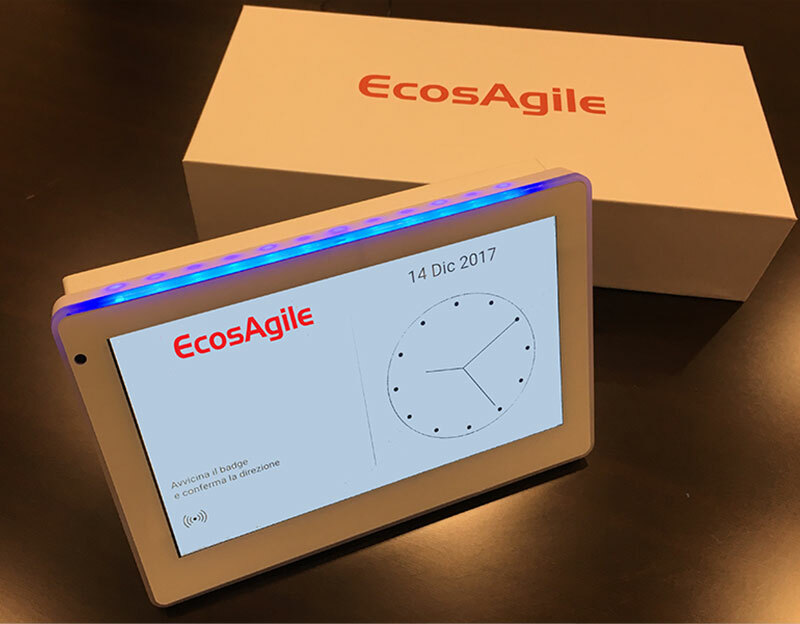 eClock has a high quality color display and among the available layouts you can choose the one with your company brand. 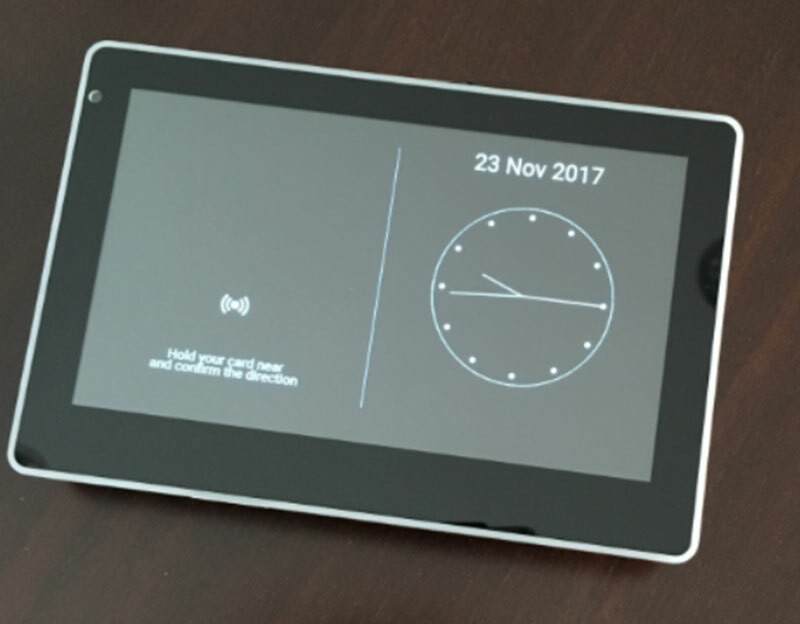 eClock has 7’’ touch screen display. 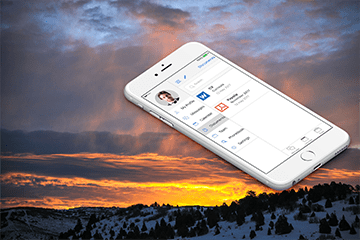 The device guarantees a perfect user experience and it can be used also to give useful information to the employee who’s clocking and it gives information about the temperature and the environment humidity, calendars, timetables and weather. eClock works with a wifi or Ethernet connection. 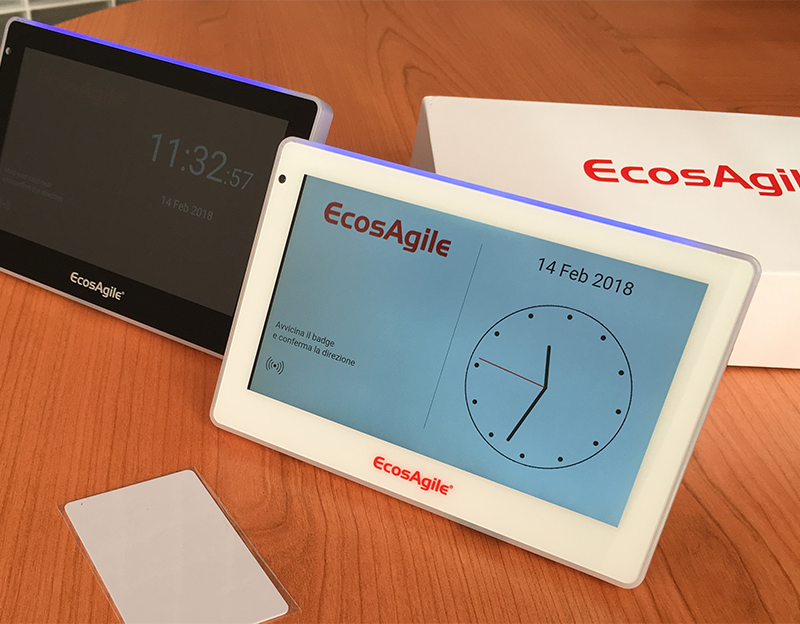 eClock is natively integrated to the EcosAgile Time attendance system and it can be integrated with API and Web Services to other already in use company systems or to the back-end features. Ecosagile Time e può essere integrata con API e Web Services ad altri sistemi aziendali già in uso in azienda o a funzionalità di back-end. 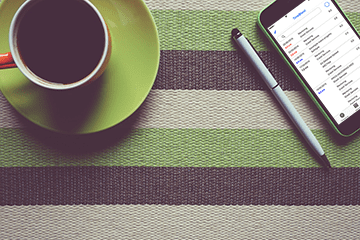 eClock allows an Attendance Tracking completely Cloud-based and via App. 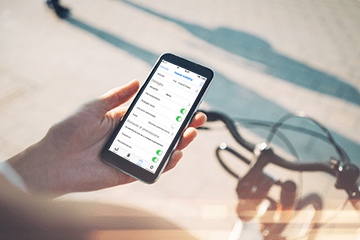 eClock offers an immediate and efficient management of the Attendances and Absences, Clockings, Accesses Control, Smart Working, Business trips, Holidays and Time-off process with their related requests and approvals workflows.